Double the fun with these ideas for a Double Trouble birthday party theme. 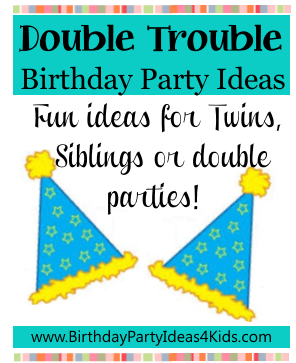 Great ideas for Double Trouble themed party games, activities, party food and more! For kids of all ages. Perfect for twin or sibling parties. Easy and great game for a Double Trouble party! Teams compete and try and wrap up their mummy the fastest in the toilet paper. You will need teams of 3 to play. Each team gets 2 toilet paper rolls. The first mummy stands still while their teammates wrap them with toilet paper. When both teammates are out of toilet paper they are done - first team done wins! Play 3 times per team so every child can be a mummy. tell them that they must use the same paper to wrap up another teammate. This is very hard because the paper won't be on a roll. Teams who finished last during the first round will have an advantage because their rolls will still have paper on them. Treasure hunts and Scavenger Hunts are a favorite birthday party game - how about combining the two for the Double Trouble birthday? Print out the list of free scavenger hunt items on our website. Cut the items out so you have 40 pieces of paper - one item per piece of paper. Hide the items in plastic eggs, plastic baggies or something that will keep moisture away from the paper when you hide them. Also buy wrist bands in two different colors - enough for each guest to have one. Before the party hide the eggs or plastic baggies around the yard, park or party room. When guests arrive divide them into teams. Tell them to find as many of the hidden clues as they can. Don't' tell them that these are actually items they will be trying to find later. When all the hidden clues have been found tell the teams that they will now have to find all of the items on their list around the neighborhood. Send them off with an adult and a large paper bag to collect their items. The twist is that the team who won the Treasure Hunt will have more items to find during the Scavenger Hunt. See our Neighborhood Scavenger hunt page for rules. Find more birthday games for your Double Trouble party on our website. Simple add a twist to each game that makes it harder the second time around. On solid color invitations (sold at craft and discount stores - check the wedding section) print the words "Double Trouble" on the top of the cards. Below print or glue pictures of the birthday kids. Verse inside: Double the Trouble ... Double the Fun! Choose two colors for the party or two shades of the same color and accent with white or black. Fill the party room with helium balloons (we like to tie strings on our and let them float to the ceiling so the birthday guests have to walk through the strings. Then at the end of the party the kids get to take the balloons home as a party favor), streamers and let some balloons stay on the floor so guests can play with them while waiting for others to arrive. Decorate the table by placing two of everything (cups, plates, utensils) at each persons place. Fill one cup with ice and the other with a drink. Tell them they must use both forks to eat the cake ... etc. A fun icebreaker game is to give everyone a nametag at the beginning of the party. On the nametag write their name and then underneath it write thier name again - only write it backwards. For the rest of the party the guests must call each other by both names.